Instructions: Click on the coupons below and a new window will pop up. 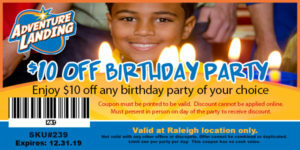 Print that page out and cut coupons to redeem at our Raleigh, NC location only. These coupons are not valid with any other discounts or special offers. Limit one coupon per person per day. It has no cash value. BUY ONE GET ONE FREE COUPONS MUST BE USED BY SAME GUEST. CLICK ON EACH COUPON TO DOWNLOAD A PRINTABLE VERSION. NOTE: YOU MUST PRESENT A HARD COPY OR PRINTED COUPON AT THE PARK IN ORDER TO RECEIVE THE DISCOUNT.